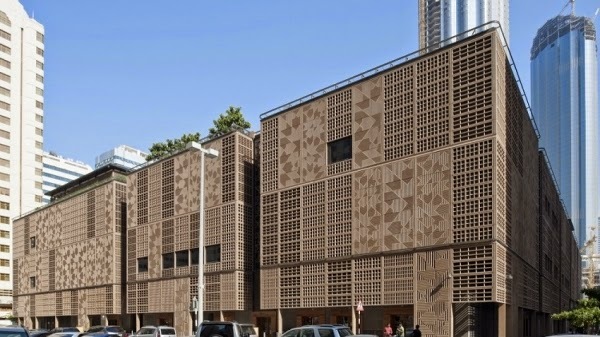 Norman Foster designed the Central Market Abu Dhabi to reverse global business centers System Archi-new - Free Dwg file Blocks Cad autocad architecture. Archi-new 3D Dwg - Free Dwg file Blocks Cad autocad architecture. Central Market Abu Dhabi is one of the oldest sites in the UAE capital. Starting from this idea and inspiration, which he called the architects "of traditional architecture of the bay," the famous British Architect Norman Foster Norman Foster to design the new Central Market Abu Dhabi building through "re-invent the market in order to give the city a new urban heart"; the words of architects Foster & Partners Foster + Partners. According to their statements explain Architects idea it is a challenge to the concept of the World Trade Center, which is usually a "one size fits all", on the contrary, here architects wanted to provide "a modern translation of the local and regional." Architects noted that Altkulailde market combines functions that are usually separate in the global business centers, a luxury goods stores, food markets, and trades character, and so the architects to integrate these functions, as in the case of traditional markets in a shady place full of natural daylight rays, and the colors of joy, fountains, amid arent rhythmic internal courtyards and corridors Linnet. "The climate here is very beautiful over a period of up to six months of the year so that it is comfortable enough to shop and sit out. That's what inspired the streets and public squares sequence where dissolve the barriers between inside and outside. It also believes these new spaces that open at night as in the day central area in the city for the celebrations and festivals, and when the situation was allowed to be naturally cooled. "In the words of Foster's office. As for the rest of the year were the architects making spaces are closed by the roof that slides into place and allow the possibility of internal atmosphere artificially control panels. Featuring those ceiling panels and interior panels in addition to the panels that exterior damage design was developed in collaboration with specialists artists Islamic arts building on Mthmnah forms refers to "all acts of traditional ceramic tiling and modern research in engineering mathematics." Architects on the surface to create a series of Turasah gardens in line with the landscaping planted a lot of green plants with a continuation of the atmosphere of Abu Dhabi green. This commercial towers above the platform and will join offices and apartments and a hotel with serviced apartments as well as rise. The interfaces towers is designed so that you do not need a lot of maintenance because of the dusty desert environment, also included interfaces layers of internal umbrellas in order to gain Blwahj and calorie control. Site area of approximately 4 hectares.